Do you need extra room for your growing kids but do not want to move out of your current school district to get it? Zoning restrictions keeping you from building out, build up. Increasing the space in your existing house through an affordable second floor home addition is more likely to serve your changing needs. Consider it the best return on your investment as a home addition will increase your real estate value. Contact Burns Home Improvements for a quote today! When you undertake a second floor home addition you can realize your dream of having a private room for yourself. Imagine the kids not fighting over the bathroom. Gain extra space for a cherished hobby or a dedicated home office. Enjoy the smile on your husbands or wife’s face when he/she escapes to his man/woman cave. Comb through magazines for ideas — and bring them to us to create a solid and workable blueprint for your home addition. We can turn your home addition dreams into reality. You do not want to get hurt, or risk your home value, with poorly performed work. Leverage our experience, training and professional standards for the best results possible. Utilize our services to identify cost-savings materials, energy savings plans and efficient methods of construction. Our professional services will pay for themselves in the final design. 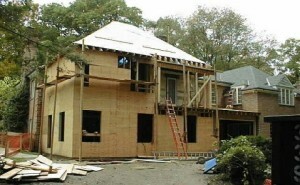 We can build a home addition in Boston, Medfield, Quincy, Westwood, and all surrounding areas.